As the maniacal good-foodie mom of a kid about to enter kindergarten, I am turning my attention to future lunchbox fillers that can compete with Tater Tots and Elio’s Pizza (can you tell what I ate in high school?). Sandwiches are going to have to be an integral part of my strategy, but wouldn’t you know it? The kid doesn’t eat sandwiches (nor do I very often, to be fair). So when he finally tried and loved grilled cheese sandwiches at his daycare, I felt a sense of relief. The breakthrough I was hoping for has happened! However, me being me, it is, of course, not possible to slap a couple of slices of American cheese on white toast and relax. I didn’t really want to make a production out of it, but wouldn’t it be nice to have a good-looking pressed sandwich with real cheese and real bread? Except that I don’t have a sandwich press. It didn’t matter. 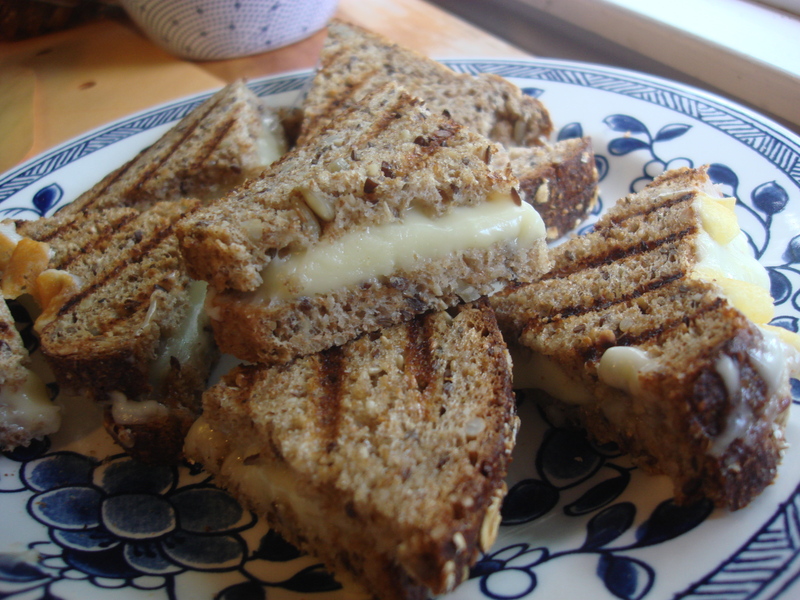 With a bit of invention, I made some delicious grilled cheese sandwiches with grill marks, even! I used my grill pan, and to achieve the press, I took a heavy skillet (with a clean bottom!) and laid it on top. Then I placed another heavy pot on top, so I could walk away for a few minutes without having to press it myself. And I got high marks from the little guy and at least one sandwich solution ready for September….Whee-hee! Who knows where we can get from here? I’m thinking BLT, baby! Heat grill pan or skillet with a smear of oil or spray. Have another heavy pan at the ready. Lay two slices of bread, buttered side up, on the grill pan. 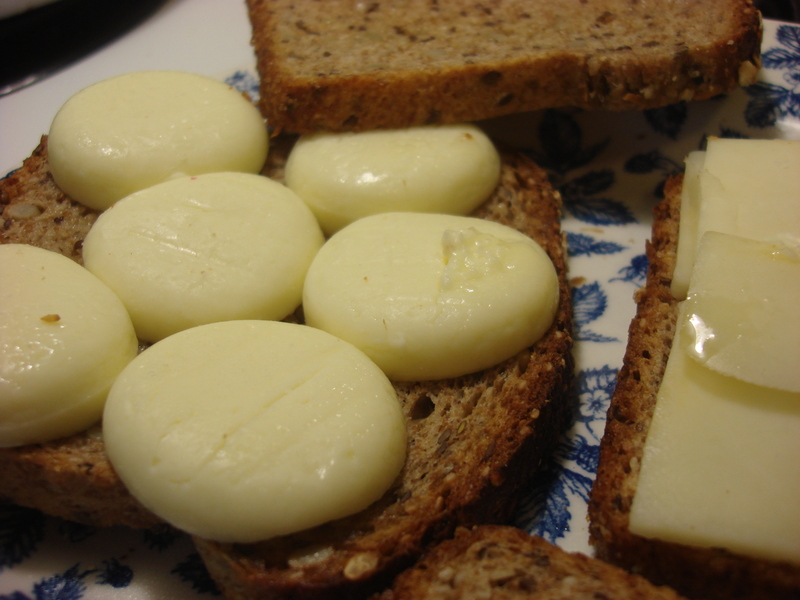 Top with cheese slices. Cover with remaining slices of bread and press under second pan. Use another heat-proof pot on top to weigh it down. Cook for about 3 minutes on each side. Remove from heat and allow to cool a few minutes before slicing. Serve! Looks so good, I would def. eat it too! Thanks so much for the kind words! 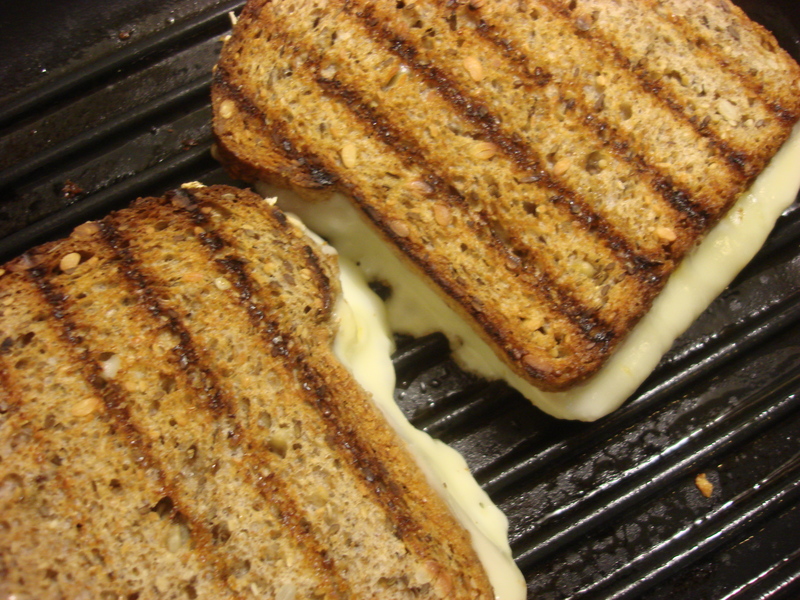 I love grilled cheese…. Those almost look like miniature Babybel cheese! The sandwich looks great!! Well-spotted! They are indeed mini-Baby Bells! My son insisted on getting the red (full-fat) ones instead of the lighter ones at Costco the other day. We both found them too unctuous and creamy to eat on their own, so we decided to give them a try in grilled cheese…worked great!!!! Thank goodness, because we have a LOT of them!